First I’ll punch in my update: I’ve found a new status quo. It’s 10 pounds lighter than my last one but I seem to be a little stuck around 165. I’m still running, in fact, I’m participating in the COLOR RUN this weekend! It’s not a fast race but a fun one. I thought the idea of physical activity with friends in a fun environment sounded like a great addition to this time of year. I’m signed up for the Turkey Trot in my local area. If you’re local too, we’re team Cold Turkey – JOIN US! So, I’m staying positive & enjoying my run endurance lengthening during my 30 work out runs. Making this thing happen! I was reading an article from Active.com (want to give them all the credit!) and thought it was a perfect one to share here. Thanks to them for some useful TRICKS and better TREAT options. Happy Halloween. Of course it’s still not too late to join me in a Candy Free October and November…and likely December too! Perhaps you have meandered into Target or your local grocery story lately and noticed the enormous amounts of tantalizing treats throughout the store. Maybe you even felt tempted to buy some, because you’ll pass the candy out to all of the neighborhood kids. But, if you buy the candy days or weeks before Halloween, you’ll have the desire to eat the candy. Here are a few helpful tricks to avoid the treats. If you don’t pass out candy then the kids will probably be disappointed, and you don’t want that. Instead, pick up candy that you don’t like. If the candy doesn’t appeal to you, then you won’t eat it. It’s a win-win situation. You won’t snack on candy and the kids will be happy. The day of Halloween is when candy is significantly marked down. You’ll save money on candy and you won’t have the lingering temptation around your house for weeks. Make sure you pass out all the candy by the end of the night. You don’t want to munch on any leftover sweets. Three Musketeers Bars: These bars are considered the low-cal chocolate candy bar. They are bite-sized candy bars that are 24 calories each and less than 1 gram of fat. Tootsie Caramel Apple Pops: Lollipops take a while to finish, so it keeps you from eating more treats. At 60 calories and .5 grams of fat, you can have the tangy caramel pop and be satisfied. Dum-Dum Lollipops: 0 grams of fat and only 20 calories. Rice Krispy Treats: For a healthier version, mix or substitute Rice Krispies for brown rice puffs. Use brown rice syrup instead of sugar. Mini Water Bottles: Parents and kids appreciate a sip of water while on the hunt for candy. Arrowhead and Kirkland make 4-ounce water bottles, perfect size to grab-and-go. Glow Bracelets: Glow bracelets, fake tattoos and stickers are great alternatives to candy and get the little kids excited. Dessert-Flavored Gum: Extra gum makes dessert-flavored gums such as Root Beer Float and Mint Chocolate Chip. They are heavenly and are only 5 calories per stick. Nabisco 100-Calorie Snack Packs: From cookies to pretzels, the little ghosts and goblins will love these snacks. Trail Mixes: Individually wrapped packages of nuts and trail mix bars are great alternatives to the Halloween candy. Not only are these healthier and lower in sugar, but they offer nutritional benefits as well. Pumpkins are great for a lot more than making jack-o’-lanterns. One cup of mashed pumpkin has only 49 calories and is loaded with vitamin A in the form of beta-carotene. It also has nearly 3 grams of fiber and 564 milligrams of potassium. Pumpkin also contains vitamin C, lutein and zeaxanthin (good for eye health), as well as iron and zinc. Pumpkin seeds are loaded with manganese, magnesium, iron, copper, vitamin K, zinc and protein. One ounce has 158 calories, 8.57 grams of protein, 1.7 grams of fiber and almost 25 percent of the recommend daily value for iron. Pumpkin seeds also have plant sterols that can help reduce the risk of heart disease and fight cancer. They are also a fantastic source of omega-3 essential fatty acids. Wash them, dry, and then toast them with garlic and onion powder and a bit of salt and pepper. They take about 30 to 40 minutes at about 300 degrees to toast. Hershey’s Fun Bar vs. Tootsie Rolls vs. Nestle Crunch: Each Hershey’s “Fun” bar has about 75 calories. A Nestle Crunch mini-bar has 60 calories, and just three Tootsie Roll Midgees have 70 calories. What about those Hershey’s Special Dark miniatures? They’re each 38 calories. Pez vs. Smarties vs. Candy Corn: One (15-tablet) roll of Smarties has 25 calories and 25 grams of sugar. The candy corn has 150 calories for 20 pieces. That’s 7.5 calories each–about the same as one almond, except that the almond is a nutrition powerhouse. One roll of Pez has 35 calories and 9 grams of sugar. And remember that many of these candies contain dyes that have been associated with hyperactivity in kids. Twizzlers vs. Peeps vs. Now and Later: Each Halloween-sized pack of Twizzlers has 140 calories- along with red dye number 40. For eight pumpkin Peeps (32 grams) the calorie cost is 110, with 26 grams of sugar (about 6.5 tablespoons). The Now and Later has 40 calories in each small bar. Tootsie Roll Snack Bars vs. York Dark Chocolate Covered Peppermint Patties: There is some misperception out there that York Peppermint Patties are healthy, but I’m not sure why. Each 13.3-gram patty has 50 calories and 9 grams of sugar. Tootsie Roll Snack Bars are also 50 calories each. Tootsie Pop vs. Charms Blow Pop (with Gum) vs. Dum Dums: That’s 60 calories for both the Blow Pop and the Tootsie Pop, and only 19.67 calories for the Dum Dum. When you go trick or treating, don’t just sit in your car and drive your kids from house to house. Get out there and walk the walk. Expect to burn about 176 calories per hour during a casual stroll. Healthy treats that taste good really do exist. For instance, Ghirardelli 60 Percent Cacao Dark Chocolate Squares (10.75 grams each) have 55 calories, but they also have at least 0.75 grams fiber, 0.5 grams protein and loads of antioxidants. And then there are Snackimals (www.worldpantry.com) made with organic grains. I also like Pumpkin Seed Cheddar Dr. Krackers (www.drkracker.com), which are made with organic whole-wheat flour. Eight crackers have 120 calories, 4 grams fiber and 6 grams protein. Along the same cracker lines there are also Mr. Krispers (http://mrkrispers.elsstore.com/) and Mary’s Gone Crackers – Original Seed Cracker (www.marysgonecrackers.com )–for 13 crackers you get 140 calories, 3 grams fiber and 3 grams protein. Popchips (www.popchips.com) are also tasty, and you get about 22 popped potato chips for 120 calories, almost double the number of fried or baked chips you’d get for the same number of calories. And what about those delicious Triple Chocolate Chunk VitaTops? They have only 100 calories each, along with 5 grams fiber and other nutrients. Another good choice would be Brothers-All-Natural Freeze-Dried Fruit Crisps (www.brothersallnatural.com), which are nothing but freeze-dried fruit. An entire bag has only 39 calories. And last but certainly not least, Larabars mini-bars are lower in calories than other bars and are made with all-natural ingredients. They’re available in Whole Foods and Kroger Supermarkets nationwide. The suggested retail is $9.49 for 12. According to research done at Yale University and reported in the Journal of Nutrition Education and Behavior, children are just as likely to choose toys as candy on Halloween. For the study, seven households offered 284 trick or treaters between the ages of 3 and 14 a choice between comparably sized toys and candies. The results showed that the children were just as likely to choose the toys as the candy. How about these toys: pencils (go to http://rootsandwingsco.blogspot.com/2009/09/pumpkin-pencil-topper-aka-non-candy.html for a way to make cute Halloween pencils), bubbles, play dough, Silly Putty. The kids are sorting through their take, and they’re loaded with candy or, in other words, junk. Obviously one day with candy is not so bad, but now you’re facing weeks of candy abuse. Why not offer to swap the candy for something bigger, maybe something the child has wanted for a long time? Sound far-fetched? Try it and you’ll be amazed. I’ve seen it work several times firsthand. Don’t buy Halloween candy too far in advance; that way you’ll have less time to eat it before you give it away! Buy candy you don’t really like so that you’re not tempted to overindulge. Eat! Make sure to fill yourself up with a nutritious lunch or dinner before trick or treating so that you’re less likely to dip into the candy bag. You know those little voices that can destroy all the work you have done and convince you of something that isn’t quite right! While my weight loss has not been as dramatic as I would like, I do see changes in my body since starting to run. The biggest is how my cothes fit. I have had a pear shape for a long time. Clothes shopping is the worst! Something that would fit my waist would not be wide enough to make it over my hips and thighs. Now while my thunder thighs are still a clapping, the noise is a little more stream lined. So to speak. Yesterday, I was trying to decide what to wear to drive an SUV full of teens on a wild goose chase around town based on clues. This year’s theme was football. Since it was 1. a sports theme and 2. having to hop in and out of a car, some appropriate, comfortable gym clothes were in order. I put the shirt on that all teams received, totally expecting it to be like so many others where it fits fine until the hips where it would look like (in the words of Steel Magnolias) two pigs wrestling in a sack. Not this time. It wasn’t loose but it wasn’t constricting either. At first I reached for my tried and true yoga pants and then I saw my pair of Nike warm up pants hanging there, taunting me. I love these pants, but haven’t worn them in years. They encased my legs like sausages and the moon would rise if I sat or bent over. Could it be? Maybe? Do I dare? I put them on holding my breath! Slid right up. I dared to breathe. Still no problem, but the true test was yet to come. A grand plie was in order. Down I went and back up again. No moon, no sun, no cutting off of the circulation and risking amputation when tissue starts to die. I wore them proudly and then the voices started. I realized this would go on and on and pretty soon as I tried to convince myself that I was happy with what I achieved, the workouts would become fewer and the calories would increase. Before I know it, all weight would be gained back and usually with some extra for good measure, and I would be a slug. I can see where I have done this before. I caught it this time though. It is not making it any easier to refute those little voices though! I must remember that this is not my stopping point. I have much farther to go. Just think how good I will look then!! Stupid Voices! I’ll show them! A month since I blogged. How does time fly so quickly? The first week I missed because I was trying to pack for Disneyland while still struggling with bronchitis. Then I went on vacation and honestly it’s like the worst ever combination for ruining routine. At least for me it is. When I get sick like that I can’t workout, I can barely make it up the stairs without blacking out and losing my breath. When I get a little cough I worry that it might turn into bronchitis so I take it easy until its gone completely. And vacation is the worst. Especially when you go to Disneyland and wear your feet out until your middle toes go numb. You don’t really feel like coming home and getting up and going on them. What progress have I made this month? None weight wise. 247 lbs but I did finally go to my doctor Monday. I got a whole lot of blood taken from me and hopefully next week we will have answers. I won’t lie. I’m scared. I’m scared at either answer I will get. Either my body isn’t working right, or I am fat and older and slower. Ie the work I have done dieting and working out isn’t enough. And it has been über hard! Honestly if weight watchers wasn’t going to work for me I don’t what will besides a major overhaul of everything I do and eat. So I am not excited. I have a sign posted to remind me that I am hormonal…not hungry!!! I seem to forget and find myself looking around in the kitchen for a snack. It happens the few days before and a few days into my “cycle”. Sometimes it is just an overwhelming loud beast I have a hard time ignoring. That’s what I’m dealing with today. Oh the cravings! Mexican food. My husband and I call it “dirty” food, because we feel “dirty” guilty after eating it. That’s what I’m craving right now. Down right dirty Mexican food! I tried to appease my cravings last night with taco salad using ground chicken and it did the job ok, but later that night I failed the urge and had a tiny quesadilla. It tasted so good, and yet, was it worth it? Today I’m working on the same crazy cravings, maybe even multiplied in intensity. I’m working on a chicken taco tonight, hoping to curb the beast within. Time will tell. 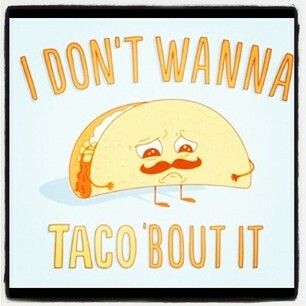 I’m just saying, it’s a good thing I don’t have fresh salsa, because those tortilla chips in the cabinet would be GONE! Does anyone else go through such maddening, almost uncontrollable cravings. It’s seriously ridiculous when I think about it, yet in the midst of it, it’s all I can do to control myself. Ah, well, I’ve stayed steady this week. I weighed in at 166 even today. It’s very slow going, but I think next week will show better (if I contain myself) since I won’t be holding in so much water…gotta love all the complexities of being a woman! Another week with no candy. Join in any time! You’ll be glad you did! 217.2 Official weigh in this week. I only got in 2 workouts this week. I’m starting to get frustrated with my consistency, but I saw this picture and realized how true it is. No matter how little I do it is still more than doing nothing. It also means if I want to get there sooner, to my goal of being healthy and thin, then I need to do more! Double edged sword. hurumph! Because I have too much free time, HA!, I have taken on another job at my church. It is going to take a lot of time at first as there is much “housecleaning” to do. This will make for some creative scheduling to get the gym in. This may not be so bad as I have been nursing a foot injury. An injury that in my hubby’s medical training would sideline me should I go to the doctor. There is much pain when I move it certain ways so I try to not move it that way. LOL! I am very afraid that should I be told to take it easy, and running would be out, then I will take it a step farther and do nothing. An excuse is all I need. I know from past behavior. I wish motivation was easier to come by. Maybe if I have a plan and can do something where I truly feel like I am “working” I could ease up without just flat-out stopping. Anyone have some ideas? Swimming laps are out as there isn’t any lap pool around. Maybe spinning? Have to think about that. I’ve started this blog post a hundred times in my head….maybe more. It’s been three weeks since I wrote anything. I’ve been mulling over what is next for me/weight loss and what changes I can make. Or maybe it has been more about what changes I am willing to make. Anyway…haven’t figured that out yet. I am pretty much in the same place I have stayed the last 4 weeks. Seriously? That is so annoying. I mean…I probably should be grateful for the week of indulgence with no significant change in my weight. Instead I feel powerless. I bust my buns, eat really well and my weight stays the same. I spend a week fostering my unhealthy habits and my weight stays the same. Needing a belt to hold up your pants (to save money on buying new pants) and the largest belts at your first stop are not big enough. Thanks for raining on my parade, Target. How all clothing stores put “women” sizes (aka – fat lady) right next to maternity. 100 degree farenheit weather in OCTOBER! People who throw trash out their car windows. I actually saw someone do that this week. I thought we had evolved past littering. Don’t you remember the crying Indian Native American man? Having to pee in the middle of the night. I need to stop before I get myself in a cranky mood since I am getting ready for a big birthday party. Can’t you tell by the way I’m writing my blog post? My goal this week is to figure out what I’m really going to do to get out of this cranky weight loss rut. As I find answers I’ll do some bonus posts. Maybe I can redeem myself for the weeks of neglect. Movement! That’s what I’ve been looking for. I’m finally seeing some, albeit, one ounce at a time. 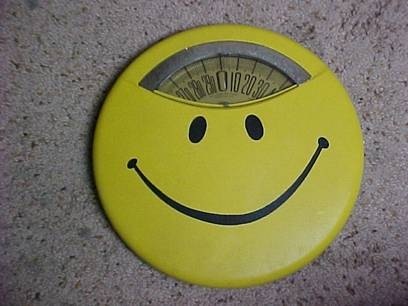 I’m still happy to report that this morning my scale smiled 165.8. It’s a slow go, but at least those pounds are going. Another milestone for me recently is my running. I actually ran 21 of my 30 minutes at the gym. Now hold your applause…I know many of you are runners. I am not, so this is good stuff for me. I’m running in the Color Run in a few weeks – a 5K and then the Turkey Trot 5K on, well, Thanksgiving. 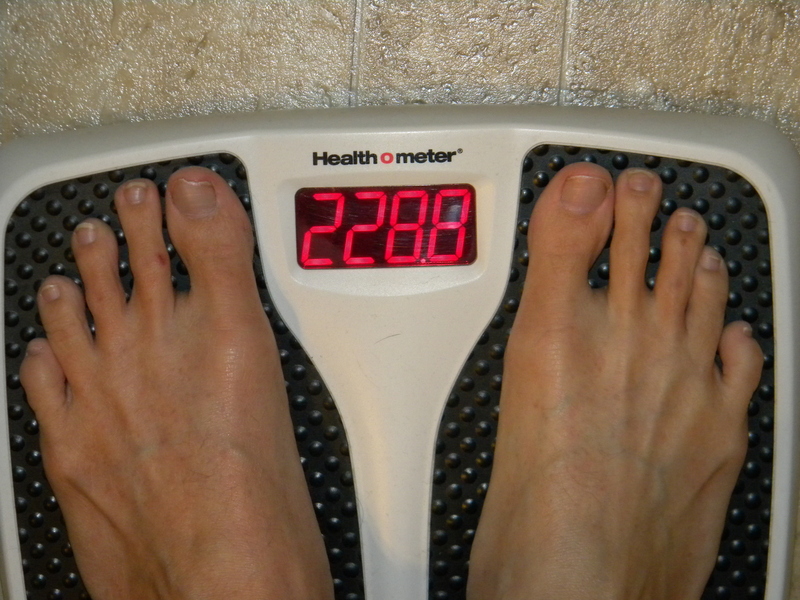 I’m hoping to run the whole race, so that’s my goal…as well as continuing my ounce by ounce dismissal of fat. Haven’t had a drop of candy and we’re half way through October. Holding strong. How about you? If you slipped, and munched on a goodie or two, don’t give up so fast. Try again! Remember your goal and I promise this will help you through some of the toughest months of the year. It seems everyone has gone MIA, including our fearless leader/founder and my posts have been pathetic. While a dear friend reassured me that this blog is about real life and real life isn’t always rainbows and unicorns, I have been a “Debbie Downer.” Yes, there is some heavy stuff going on in my life, I don’t have to let it drag me down into the pits of despair and undo all I have worked hard to do. I have been trying to maintain my goals, but it definitely isn’t easy as distractions abound and I am just plain worn out. Time to refocus, because being healthy will allow me to deal with things better. At least that is the plan. I have gained 2 pounds but I am chalking that up to “that” week and not getting to the gym more than twice. Considering some would say that the 7 pound loss last week was too much in that time period, I am not too upset. 5 1/2 weeks to the Turkey Trot- A 30min 5k would be awesome! Sleep- Must get some! Not starting out too well considering that it is 1:18am. Must do better! Food- I haven’t done badly here, but there is always room for improvement! I can do it. You can do it! We can do it! I stepped on the scale this morning and was pleased with my number. It smiled back at me with 167.6. We’re heading in the right direction. It’s been stagnant for so long, this is fantastic. It’s not where I want to land, but movement in the right direction is so rewarding. I’ve had to be careful on my physical movements lately because of my minor procedure on my back, but it’s not as bad as I prepared myself for, so today I plan to go to the gym to do some cardio and LB workout. Even eating out a few nights this week, I was careful to make wiser decisions. The molten lava cake with my friend was probably not a wise decisions, but the 2-3 small bites and done was. Splitting meals with her, and with my hubby on yesterday’s outing has worked. I can’t do that all the time, but I can also not indulge in every whim because we’re eating out and don’t I deserve to enjoy my meal. Chicken tacos with steamed veggies as a side was actually very delicious. So, making better choices is getting easier…and even though JP is still passing me up on the numbers, it is so helpful to have him beside me on this journey. Hey! Who wants to join me for a NO CANDY October and November?! Did it last year and it was great. There is a LOT of junk out there and if you already know the answer is NO, you don’t have to worry about how many you’ll allow yourself and then feel bad when you pass that up horribly. See! I’m helping you through such trama! Join me!